As far as base products go, 2005 Topps Updates and Highlights Baseball is loaded. A last rookie hurrah before new rookie card rules came into play in 2006, this set is loaded with first-year players. And not all of them stink either. 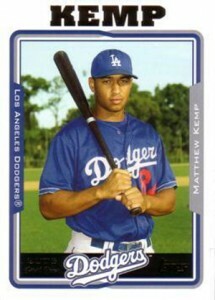 Matt Kemp, Jered Weaver, Andrew McCutchen and Ryan Braun are just some of the players to have their first pack-inserted Topps cards in 2005 Topps Updates and Highlights Baseball. The base card design is the same as 2005 Topps Baseball. Fairly plain, the glossy look includes white borders and a thin frame around the photo. Numbers have the prefix UH on the back. 2005 Topps Updates and Highlights Baseball is a 330-card set. Besides showing players in new uniforms, subsets include draft picks, league leaders, postseason highlights, All-Stars and Home Run Derby. The main parallel set is Gold (#/2005). There are also Printing Plates and Blue (1/1). Black parallels, which were in the flagship set, are not included here. Relics combine to fall one per hobby box, the majority of which are All-Star Stitches cards. Topps had exclusive rights to All-Star Game gear. These relic cards use swatches from warm-up jerseys used during the event's festivities. Other relics sets include All-Star Patches, Derby Digs Jersey and extremely rare ball relics honoring the newly established Washington Nationals. Hall of Fame inductees Wade Boggs and Ryne Sandberg each have game-used bat cards. There is also a dual relic with both of them. 2005 Topps Updates and Highlights Baseball has a handful of autographs that fall under the Signature Moves banner. Justin Verlander is the key signer. Signature Moves autographs have a Red Foil parallel that is limited to 25 copies. The set does not have a lot of basic inserts. A small ten-card set showcases the Nationals' Opening Day lineup. The Barry Bonds Home Run History checklist, which began in 2005 Topps Baseball, has another 330 cards added, charting career homers 331 to 660. Besides traditional packs and boxes, 2005 Topps Updates and Highlights Baseball was also released as a factory set. Unlike the previous several years, Topps Chrome Update got its own release. From 2001 to 2004, Topps Update and Topps Chrome Update cards were packaged together.